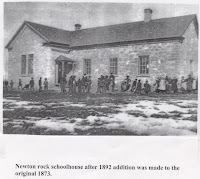 Picture of the Newton Rock School built in 1873 with an 1892 addition. In 1871 Franlin W Young buildt a good size log house in which the first school was taught by Elizabeth Annie Griffin. In 1873 a new school house was built. It was 23 x42 feet/ erected on the east side of the public square.The people taxed themselves 3 percent for three years to raise means for its construction.. The library has records of the school in Newton from 1875 including 1886 , Also 1891/1892. These are great genalogy tools as they list students and parents for this peiod of time. We have one copy that can be checked out . From some notes: The Newton School was "to begin and close at the pleasure of the trustees. "and teachers signed contracts without knowing how long the school was to be run. The minutes of March 19, 1897, state that the, "Nest question how long shal the prymary School be kept up it was agree to keep it up as long as there are puble anough for 2 Schooles and mony will hol out"
they were"in need of som paiment "